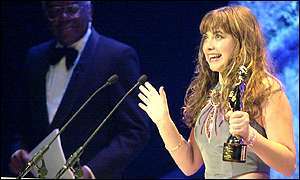 Teenage singing star Charlotte Church has been named British artist of the year at the first Classical Brit Awards. Another Welsh singer, baritone Bryn Terfel, was named male artist of the year in the ceremony set up to promote classical music and Argentinian pianist Martha Argerich was awarded the female artist of the year title. Violinist Nigel Kennedy received an award for his outstanding contribution to classical music. Newsreader Sir Trevor McDonald hosted the event at the royal Albert Hall, London, which included performances by Kennedy and another violin virtuoso, Vanessa Mae. The award to Church ends a turbulent few months for the young star. Earlier this year, she sacked her manager Jonathan Shalit - the man who first spotted her talent and helped her to win a recording deal. Mr Shalit later sued the singer and her parents for a share of her earnings. Kennedy - who once cultivated a more punk than classical image - was awarded for his success in popularising the genre. His performance of Vivaldi's Four Seasons sold more than six million copies and topped the classical charts for more than six months. Terfel notably played the lead role in the Royal Opera House production of Verdi's Falstaff late last year. Italian tenor Andrea Bocelli was honoured by Classic FM listeners when they voted his Sacred Arias album of the year. Celebrities like Miranda Richardson, Sir George Martin and Lord Puttnam were among guest presenters handing over titles to the winning performers.